The Book Date : The Beekeeper's Ball. Susan Wiggs. The Beekeeper's Ball. Susan Wiggs. 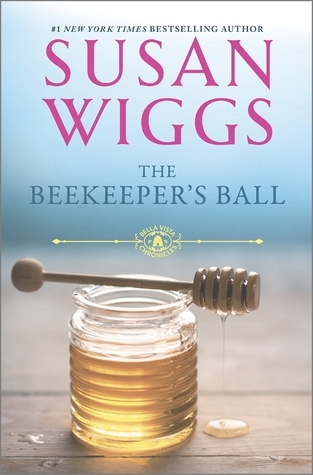 The Beekeeper's Ball is the second book in the Bella Vista Chronicles. It is a worthy follow up to The Apple Orchard. I loved the setting, the family atmosphere, the mystery, the history, the courage and the depths of both emotional warmth and sadness. This story centres mainly on Isabel, raised by her grandparents, never having known her parents who were taken from her from birth. She has ventured out into the world for awhile, but now feels safest at Bella Vista. She loves to cook, it fulfils her to nourish others with her food and care. This can be especially seen in the way she takes in Jaime, a young woman, who happens by. Isabel sees something of herself in Jaime, and is ideally suited to reach out to her. Into her world arrives Cormac O'Neill, their first meeting is full of drama. Indeed Isabel's world will never be the same as he breezes in, bringing fresh insights into her life. He has come to write the biography of Magnus. I loved the way he fits into the family, bringing his own gifts and open to receive what is offered by this new opportunity. Most of all I loved the story of Magnus, his wife Eva and Annaliese. At first I had been reluctant when reading the blurb for the story. I thought to myself I dislike being taken backwards and forwards, being pulled from one story into another. I was so wrong. I loved this part of the story. I had been drawn towards Magnus in The Apple Orchard. Annaliese too was very much part of that book. Now the mysteries of their lives are revealed in this book. We are taken back into Denmark during World War 2, into the courageous worlds of Magnus, Eva and Annaliese. What hardship and cruelties they endured, how amazing that out of such horror, these people could move into the future with such positivity and letting go. For me this was the best part of the book. I sense there are more stories to be told in Bella Vista Chronicles. I want to know more about the family and their neighbours - Ramon's family, and his daughter Lourdes. There is still mystery surrounding Isabel's father, and I would love to follow Jaime a little more. And of course to follow this wonderful family a little longer along the road would be rewarding reading. I've never read a Susan Wiggs book before and this one sounds like a wonderful read and how gorgeous is that cover? I'd frame it as a piece of art :) I can't wait to read this one but I'm definitely going to read The Apple Orchard first. Fantastic review Katherine! Thanks Kimberley, yes the cover is gorgeous and this series very good. Thanks Sheree. This was a great second book - have you read The Apple Orchard - or is it on your TBR shelf? This sounds wonderful - I want to read this. Yes this one and the first one are wonderful reading. Do try them.